Even though it has been moist and cooler this past week, I feel the transition between spring and summer. The evenings have more heat and last longer, the asparagus has finished, we are harvesting the first zucchinis, training the field tomatoes, measuring the corn each day to see if it is "knee high", enjoying our first batch of pesto and pea pasta and finishing off our spring jobs. The past few weeks have been an excellent time for transplanting. We planted flowers, herbs, melons, cucumbers and broccoli for the summer share. We are trialing row covers for the brassicas (broccoli, cauliflower and cabbage) this summer. The white cabbage moths need to land on the brassica plants to lay their eggs that hatch into the little green caterpillars, which can decimate young plants or just fill them with fat green caterpillars. In principle, the row covers solve the problem - the butterflies cannot land on the plants. No eggs, no caterpillars. It will be interesting to see if the row covers affect other aspects of growth. We make extensive use of compost to amend our soil and enrich the humus matter. 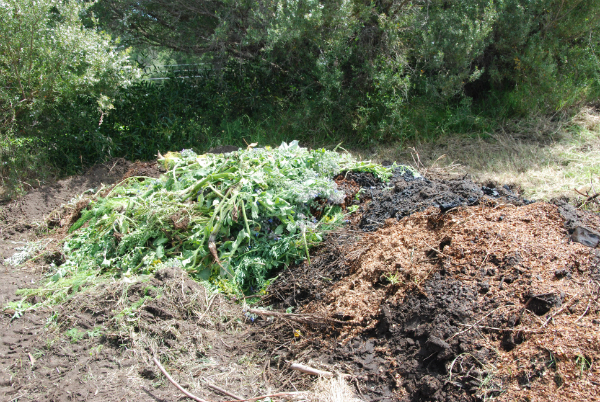 As most of the material we use in the compost is gathered from the farm, making a pile takes a few days. We cut grass, thin out all of our wonderful micronutrient accumulating herbs, collect sawdust, shift the wood ash from a burn pile, and gather manure. Over the course of a few days, we slowly layer a 5m long*1.5m wide pile, using our seaweed brew to add moisture throughout. Our spring pile is usually ready by autumn. This past week, we have been spraying...the whole farm. Biodynamic Agriculture, in addition to many sustainable agricultural practices, also includes a series of "preparations" which help to develop strong soil biology and plant growth. In spring, we take advantage of the warm soil and moist air and "seed" beneficial bacteria and soil fungi which are the beginning of life under the soil and the building of the complex ecosystem which provides plants with optimum health. We also use another preparation to aid with photosynthesis and to help plants with the uptake of minerals and trace elements. These two sprays together help strengthen plants against insect, fungal and bacterial attacks. Transition Farm welcomed our first intern this week! Despina will be doing a four-month internship with us learning about the practical application of farming with the moon and making and using different biodynamic preparations. Despina is an accomplished gardener, and a trained permaculturist. We are privileged to have her here. In addition to these, we are spraying seaweed brew. Seaweed contains 14 Amino acids and over 60 trace elements and minerals. We use the seaweed brew as a foliar spray to give plants those trace extras in the same way as humans take daily vitamin pills. We have also been using a stinging nettle and a Casuarina (She-Oak) brew to promote growth and tighten the fluid in the plants and prevent fungal infestations like powdery mildews, rusts and moulds (respectively). With different brews at various stages of decomposing, our children have named the area of the farm with all of these bathtubs, drums and buckets "Stinking Good" Corner. Next week, we will be weeding, training tomatoes, harvesting flowers and herbs for making preparations and spraying more "stinking good" brews. This weeks companion planting article is Chamomile - The Plant's Physician. Gardening notes for this week have also been posted. These gardening notes offer further insight into the biodynamic and sustainable farming practices that we are using as well ideas for the home gardener.